Laptop Arms are the ultimate solution for anyone looking at ergonomic laptop working. 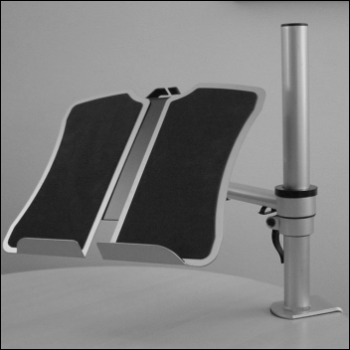 A laptop arm offers a laptop user the means of positioning their screen in precisely the right position for ergonomic working and completely clearing their desk for other activities. Although this type of laptop stand is not portable, it has the benefit of more flexibility in terms of positioning the laptop screen and so has become a desktop favourite. There are many models available, but the design principle is the same with all of them and that is replacing the monitor on the end of a monitor arm with a device to hold a laptop or tablet.